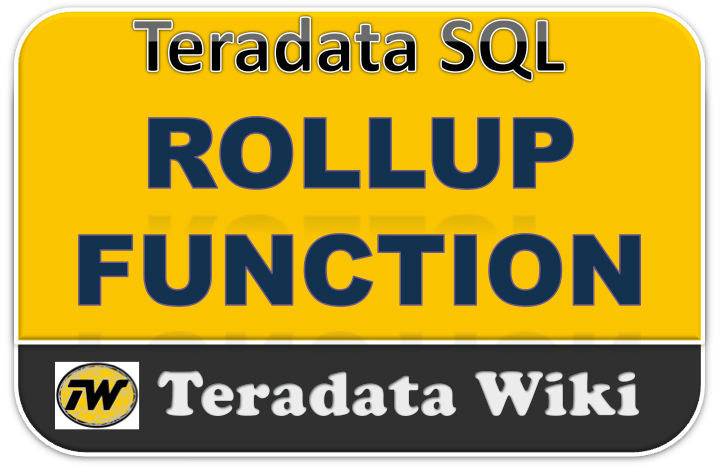 The teradata ROLLUP function is used, when ever an aggregation is required across all levels of a hierarchy within a single dimension. Lets take geography is a dimension. You might have 3 levels of hierarchy - city, county and state. You may wish to produce sum of revenue amounts across all three levels. Produce a sum of revenue amounts across all three levels. Aggregate at the lowest level (city) and 'rollup' those aggregations to the next level (county) and finally rollup to the top level (state). Provide a grand total across all three levels. All of these are easily done with the ROLLUP feature. Using the GROUP BY function, produce a total of salaries by department for department numbers less than 402. Using the ROLLUP function, produce salary totals by department. There is an additional row with a '?' department number. This row represents the rollup of all department salaries which is the top (and only) level of the hierarchy in this case. The '?' does not represent a null, rather it represents the 'total' of all department salaries. Produce a hierarchy of total salaries by department within manager. Three separate aggregations taking place in the preceding query. Totals for each dept/manager combo (black). This is represented as the set '(manager,department )' and is the bottom of the hierarchy. Totals for each manager across all departments (red). This is represented as the set '(manager )' which is the middle of the hierarchy. A total for all depts across all managers (blue). This is represented as the set '( )' and is the top of the hierarchy. As previously indicated, the row with the '?' represents the grand total of all salaries across all departments. But what if there was a department number with a null? How would we distinguish between it and a 'total' row? a function exists which permits the report to be more easily read.